María Rosalía Rita de Castro (Galician pronunciation: [rosaˈli.ɐ ðɪ ˈkastɾʊ]; 24 February 1837 – 15 July 1885), was a Galician romanticist writer and poet. Writing in Galego, the Galician language, after the period known as the Séculos Escuros (lit. Dark Centuries), she became an important figure of the Galician Romantic movement, known today as the Rexurdimento ("Renaissance"), along with Manuel Curros Enríquez and Eduardo Pondal. Her poetry is marked by saudade, an almost ineffable combination of nostalgia, longing and melancholy. She married Manuel Murguía, a member of the important literary group known as the Royal Galician Academy, historian, journalist and editor of Rosalía's books. The couple had seven children: Alexandra (1859–1937), Aura (1868–1942), twins Gala (1871–1964) and Ovidio (1871–1900), Amara (1873–1921), Adriano (1875–1876) and Valentina (stillborn, 1877). Only two of Rosaía's children married, Aura in 1897 and Gala in 1922; neither they nor their siblings left any children, and thus, today there are no living descendants of Rosalía de Castro and her husband. Their son Ovidio was a promising painter, his career cut short by early death. Rosalía published her first collection of poetry in Galician, Cantares gallegos [gl] ("Galician Songs"), on 17 May 1863. This date, 17 May, is now known as the Día das Letras Galegas ("Galician Literature Day"), and commemorates Rosalía's achievement by dedicating, every year, this special day to a different writer, who must also write in the Galician language, since 1963. Día das Letras Galegas is an official holiday in the Autonomous Community of Galicia. Relative poverty and sadness marked Rosalía's life, in spite of this, she had a strong sense of commitment to the poor and to the defenseless. She was a strong opponent of authoritative abuse or abuse of authority and an ardent defender of women's rights. Rosalia suffered from uterine cancer and died in Padrón, province of A Coruña, Spain, on 15 July, 1885. She is buried in the Panteón de Galegos Ilustres, a pantheon (mausoleum) in the Convent of San Domingos de Bonaval in Santiago de Compostela, Spain. Statue of Rosalía de Castro at Padrón. Rosalia de Castro is today one of the unquestionable poet laureates of Galicia (Spain). Highly educated, expected to speak and write in Spanish only, she took the bold, unconventional step of writing her early poems in the Galician language. Her defiance earned her the contempt and spite of many that deemed Galician as a Spanish dialect fit "only for the illiterate and the churlish". However, Rosalía's defiant gesture won her the love and admiration of the common folk, who spoke Galician at home or on a daily basis. Schools in Galicia, in Spain, in Russia and in Uruguay, libraries, cultural associations, awards, parks, folklore groups, choirs, compositions of her poems, a Galician traditional morning song adorned with the lyrics of one of her poems, a professional sports team, monuments at home and abroad, a theater, restaurants, a label of white wine, lodgings, a banknote formerly in circulation, a postage stamp, a FS98 Iberia Airbus A340, a sea-rescue plane, a school train and many streets have all taken her name. Small Stations Press published Rosalía de Castro's Galician Songs in English, translated by *Erín Moure, in 2013 . The Moure translation of de Castro's New Leaves is expected to be published by Small Stations in September, 2016. Edwin Mellen Press also published in 2010 "the most thorough and representative volume of poetry and prose from Rosalia de Castro (1837–1885) ever translated into English." In 2007, Shearsman Books published a paperback of selected poems translated by Michael Smith. In 2004, Louis J. Rodrigues wrote for the literary magazine Babel a translation and analysis of two Rosalian poems, Nasín cando as prantas nasen and Negra Sombra. In 1991, State University of New York Press launched an English anthology edited and translated by Anna-Marie Aldaz, Barbara N. Gantt and Anne C. Bromley. In 1977 Kathleen Kulp-Hill translated several Galician poems as part of her work entitled "Rosalía de Castro"; this book is still available from AllBookstores.com. 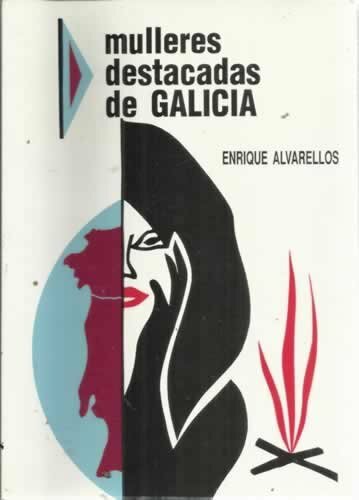 In 1964 the Spanish Ministry of Foreign Affairs published a selection of Galician poems translated into English by Charles David Ley; this book may be found in Spanish Rare Books libraries. In Japan, the first volume of Rosalian poetry was translated in 2009 by Takekazu Asaka which is available from DTP Publishing (Tokyo). In the nineteen-nineties Katsuyo Ohata wrote two articles in the journal, "The Review of Inquiry and Research" at Kansai Gaidai University (Osaka, Japan) on the Galician poet: "El inconsciente creativo de Rosalía de Castro" and "En las orillas del Sar: El mundo íntimo de Rosalía de Castro." Editoria Crisálida, in 2008, published an anthology of Rosalia's Galician poems in Portuguese, translated by Andityas Soares de Moura. There is a statue in her honor in the Galicia Square in the city of Porto, Portugal, by the sculptor Barata Feyo (September 1954). In the French-speaking world Folle Avoine in 2003 offered a French anthology of Galician poems translated by Jose-Carlos Gonzalez. Monument to Rosalía de Castro at Porto, Portugal. The name Rosalía de Castro has been used by several institutions, public spaces and/or parks, and on consumer goods, thus showing the social influence and impact this poet has had on the region. Today, it is possible to find schools and universities named after the writer in the Spanish Autonomous Region of Galicia as well as other parts of Spain. Russia, Venezuela (Teatro Rosalía de Castro) and Uruguay also have places that bear the name of this distinguished poet. Furthermore, there are numerous parks, plazas and streets, cultural associations, prizes granted to people that are intimately linked with the Galician and Spanish languages, libraries, folk groups, choirs, and even a wine with the name Rías Baixas. There is also a plane from the airline Iberia, as well as an aircraft belonging to the Maritime Safety and Rescue Society (Salvamento Marítimo), have been given the name of Rosalía de Castro. Moreover, there are a multitude of monuments, commemorative plaques and sculptures dedicated to her in many parts of the world. 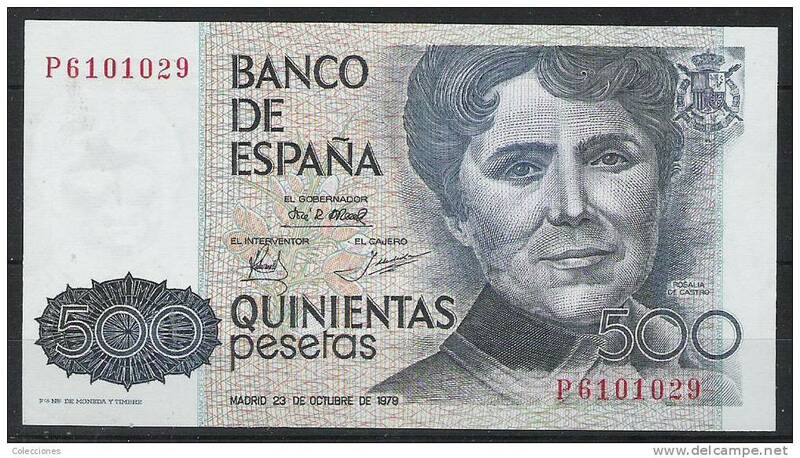 On 23 October 1979, the last of the 500 peseta bills was printed, being that in 1987, this bill was to be substituted by a coin of the same value. The bill had the portrait of Rosalía de Castro displayed on the obverse side, created by Pablo Sampedro Moledo: on the reverse side were the House/Museum of Rosalía located in Padrón and a few handwritten verses from Rosalía de Castro's work Follas Novas. With the printing of this bill, Rosalía de Castro became, excepting Isabella I of Castile, the only non-allegorical female to be placed on the obverse side of a Spanish bill. Bust of Rosalía. Paseo de los Poetas, El Rosedal, Parque Tres de Febrero, Buenos Aires. Antón García Abril set Cuatro canciones sobre textos gallegos (1957–1962). Octavio Vazquez set "En Cornes" and "Como Chove Miudiño", and wrote two instrumental scenes on "Nosa Señora da Barca" and "Eu Ben Vin Estar o Moucho"
^ Rosalia de Castro School Association. Vigo. ^ Rosalia de Castro Public School. Majadahonda (Madrid). ^ Rosalia de Castro High School no. 1558 on YouTube. Chukotsky Proezd 6, 129327 Moscow. ^ Rosalia de Castro Library. Vilagarcia de Arousa (A Coruña). ^ Rosalia de Castro Cultural Association. Cacheiras (A Coruña). ^ Rosalia de Castro Cultural Centre on YouTube. Ciudad de Buenos Aires (Argentina). ^ Rosalia de Castro Cultural Society on YouTube. Havana (Cuba). ^ Premio Rosalía de Castro para María Esther Vázquez. Revista Archivos del Sur. ^ Agrupación Rosalía de Castro on YouTube. Centro Gallego de Madrid. ^ Agrupación Folclórica Rosalía de Castro de Padrón on YouTube. ^ Cuban Grupo Folclórico Rosalía de Castro performing in Pobra do Caramiñal on YouTube. ^ Coral Rosalía de Castro de Pontevedra on YouTube. ^ Coral Rosalía de Castro de El Palmar (Murcia). ^ Amancio Prada, 1998: "Rosas a Rosalía." Fonomusic. ^ Gary Bachlund, composer: "Dos Canciones de Rosalía de Castro." ^ Morning song "Rosalia de Castro" (traditional vocal) Archived 2011-07-19 at the Wayback Machine; excerpt offered on Teemix—Un site auFeminin.com Network. ^ Abe Rábade, Guadí Galego and Anxo Angueira. Morning song "Rosalía de Castro" (jazz) on YouTube; track 10 of the 2008 album "Rosalía 21." ^ Carlos Núñez, Fernanda Takai and Alê Siqueira. Morning song "Rosalía de Castro" (fusion) on YouTube; track 1 of the 2009 album "Alborada do Brasil." ^ Rosalia de Castro Basketball Team. Santiago de Compostela. ^ Rosalia de Castro statue. Padron (A Coruña). ^ Monument to Rosalia de Castro on YouTube. Alameda. Santiago de Compostela. ^ Rosalia de Castro statue. Ferrol (A Coruña). ^ Monument to Rosalia de Castro. Praça da Galiza. Oporto (Portugal). ^ Rosalia de Castro bust on YouTube. Buenos Aires (Argentina). ^ Rosalia de Castro bust[permanent dead link]. Parque Independencia. Rosario (Argentina). ^ Rosalia de Castro bust on YouTube. La Rambla. Montevideo (Uruguay). ^ Teatro Rosalía de Castro on YouTube. A Coruña. ^ Restaurante Rosalia de Castro Archived 2009-03-03 at the Wayback Machine. Vigo. ^ Bar Restaurante Rosalia de Castro Archived 2011-07-08 at the Wayback Machine. Cornellà de Llobregat (Barcelona). ^ Restaurante "Rosalia de Castro". Berne (Switzerland). ^ Rosalia de Castro Albariño. Sociedad Cooperativa Vitivinícola Arousana. ^ Hotel Rosalia. Padrón (A Coruña). ^ Hotel Rosalia de Castro. Poio (Pontevedra). ^ Hotel Gastronómico Casa Rosalia on YouTube. Os Ánxeles (A Coruña). ^ Banknote with the portrait of Rosalia de Castro Archived 2011-07-09 at the Wayback Machine. Delcampe International. ^ Postage stamp with the portrait of Rosalia de Castro. Sociedad Filatélica de Madrid. 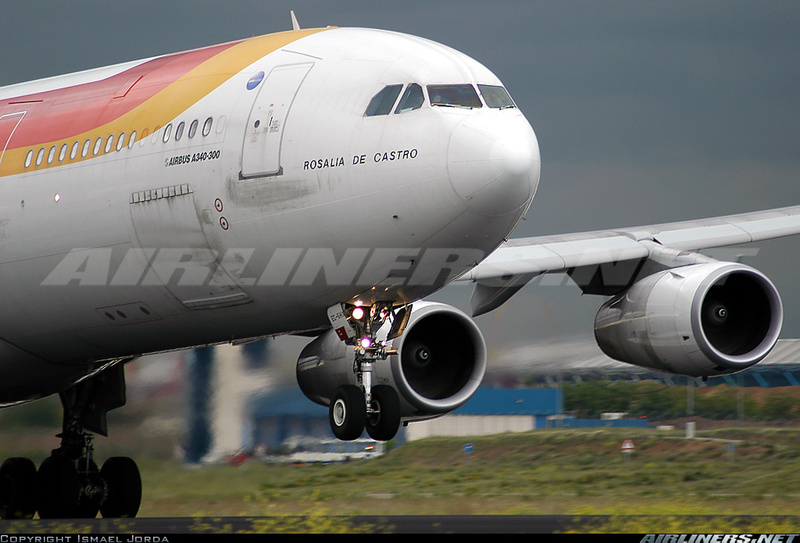 ^ FS98 Iberia Airbus A340 Rosalía de Castro. Airliners. Net. ^ CN-235 de Salvamento Marítimo sobre la Ría de Vigo on YouTube. ^ School train Rosalia de Castro on YouTube. ^ Pensión Residencia Puente de los Santos Archived 2011-02-07 at the Wayback Machine. Avenida de Rosalía de Castro nº 18 bis. Ribadeo (Lugo). 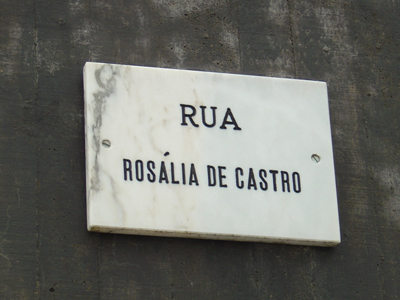 ^ Commemorative plaque to Rosalia de Castro. Calle Rosalía de Castro. Gijón (Asturias). Escultura Urbana. ^ Street sign in Braga (Portugal). Braguinha Blog. ^ John P. Dever and Aileen Dever: "The Poetry and Prose of Rosalía de Castro: A Bilingual Facing Page Edition." Lewiston, NY: Edwin Mellen Press. 2010. ^ Rosalia de Castro and Michael Smith: "Rosalía de Castro: Selected Poems Archived 2009-06-06 at the Wayback Machine." Exeter, UK: Shearsman Books. 2007. ^ Louis J. Rodrigues, 2004: "Rosalía de Castro's Galician poems: Nasín Cand... and Negra Sombra." Babel, 50, No. 1, pp. 60–75. ^ Rosalia de Castro, Anna-Marie Aldaz, Barbara N. Gantt and Anne C. Bromley: "Poems by Rosalía de Castro." Albany, New York: State University of New York Press. 1991. ^ Kathleen Kulp-Hill: "Rosalía de Castro." Boston: Twayne Publishers. 1977. ^ AllBookstores.com: "34 titles listed under subject: "Castro, Rosalia De 1837–1885." ^ Rosalía de Castro and Charles David Ley: "Poems of Rosalía de Castro." Madrid: Ministry of Foreign Affairs. 1964. ^ Librería Anticuaria "José Manuel Valdés" (Oviedo, Spain). ^ Professor Takekazu Asaka talks about his learning of the Galician language and his translation to Japanese of Cantares Gallegos. In O Galego do Xapón on YouTube. ^ Katsuyo Ohata, 1992: "El inconsciente creativo de Rosalía de Castro." The Review of Inquiry and Research. Kansai Gaidai University. ^ Rosalia de Castro and Andityas Soares de Moura "A rosa dos claustros: poesia galega (bilíngue)". Belo Horizonte, Brazil: Editora Crisálida. 2008. ^ Rosalia de Castro and Jose-Carlos Gonzalez: "Anthologie poétique. Edition bilingue français-galicien." Bédée, France: Folle Avoine. 2003. ^ "Banco de España – Banknotes and coins – General public – Peseta banknotes and coins". www.bde.es. Retrieved 2016-12-03. ^ Carballo, R. (1981) . 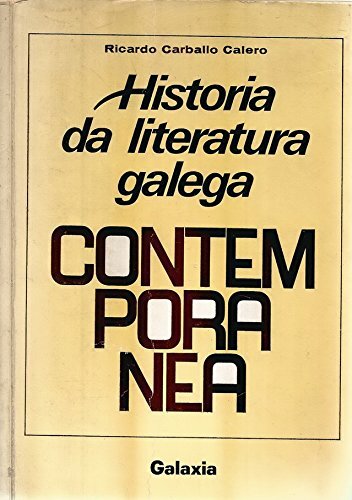 Historia da Literatura Galega Contemporánea. Galaxia. pp. 143–234. ISBN 84-7154-391-5. Actas do Congreso Internacional de Estudios sobre Rosalía de Castro e o seu tempo, v. 1, v. 2, v. 3 (1986). CCG. USC (in Galician). Alonso Girgado, Luís (1994). Rosalía de Castro, rosa de sombra (in Spanish). Ediciones Torremozas. ISBN 84-7839-141-X. Alvarellos, Enrique (1993). Mulleres destacadas de Galicia (in Galician). Alvarellos Editora. pp. 62–64. ISBN 84-85311-96-5. Álvarez Ruiz de Ojeda, V. (1988). Rosalía de Castro para nenos (in Galician). Madrid: Ediciones de la Torre. ISBN 84-86587-26-3. —————— (1997). 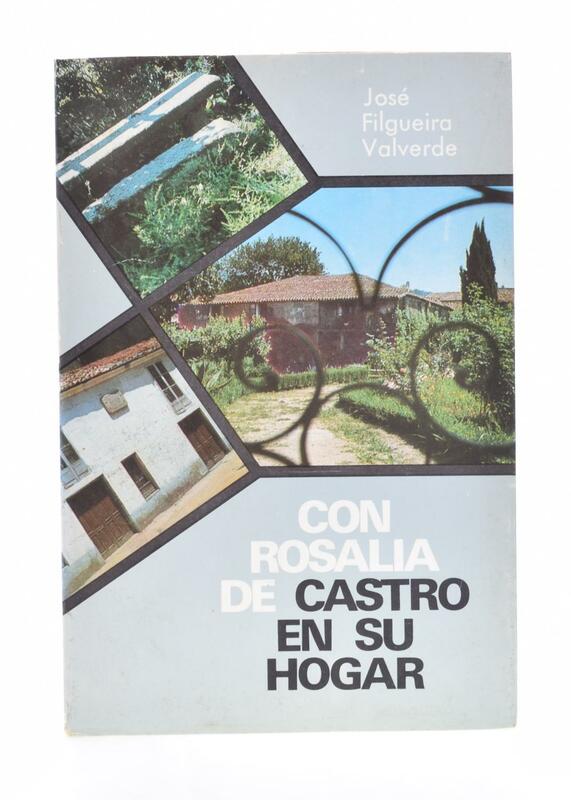 "Un importante documento para a biografía de Rosalía de Castro". Grial (in Galician) (136): 479–501. —————— (1999). "Sobre as orixes de Rosalía de Castro: a inclusa de Santiago de Compostela e o caso de Josefa Laureana de Castro". A Trabe de Ouro (in Galician) (39). Blas, Ceferino de (2013). Rosalía de Castro y Faro de Vigo en el 150 aniversario de Cantares Gallegos (in Spanish). ISBN 978-84-616-5429-1. Briesemeister, Dietrich (1959). Die Dichtung der Rosalía de Castro (in German). München: A. Bergmiller & Co.
Carballo, R. (1975) . "IV". Historia da Literatura Galega Contemporánea (in Galician). Galaxia. pp. 143–234. ISBN 84-7154-227-7. Davies, Catherine (1987). Rosalía de Castro no seu tempo (in Galician). Editorial Galaxia. ISBN 84-7154-583-7. —————— (1990). Rosalía de Castro e Follas Novas (in Galician). Editorial Galaxia. ISBN 84-7154-725-2. Fernández del Riego, Franciso (1971) . Historia da literatura galega (2ª ed.). Vigo: Editorial Galaxia. pp. 95–101. Filgueira Valverde, J. (1974). Con Rosalía de Castro en su hogar (in Galician and Spanish). Patronato Rosalía de Castro. Henri Poullain, Claude (1989). Rosalía de Castro e a súa obra literaria (in Galician). Galaxia. ISBN 84-7154-687-6. March, Kathleen (2005). "Castro, Rosalía de". Gran Enciclopedia Galega Silverio Cañada (in Galician). ISBN 84-87804-88-8. Marco, Aurora (2007). Dicionario de Mulleres Galegas (in Galician). A Nosa Terra. pp. 99–103. ISBN 978-84-8341-146-9. Mayoral, Marina (1974). La poesía de Rosalía de Castro (in Spanish). Madrid: Gredos. ISBN 84-249-0571-7. Murguía, M. (1886). Los Precursores (in Spanish). A Coruña: Latorre y Martínez editores. Imprenta de La Voz de Galicia. Pereira Bueno, Fernando (2014). Rosalía de Castro: Imaxe e realidade (in Galician). Xerais. ISBN 978-84-9914-565-5. Rodríguez Sánchez, Francisco (2011). Rosalía de Castro, estranxeira na súa patria (a persoa e a obra de onte a hoxe) (in Galician). AS-PG. ISBN 978-84-89679-99-3. Vilavedra, Dolores, ed. (1995). Diccionario da Literatura Galega (in Galician). I. Galaxia. pp. 127–130. ISBN 84-8288-019-5. ——————, ed. (1997). Diccionario da Literatura Galega (in Galician). II. Galaxia. ISBN 84-8288-137-X. Wikimedia Commons has media related to Rosalía de Castro. Fundación Rosalía de Castro (in Galician). RAG. Figuras homenaxeadas (in Galician). Álbum de mulleres Consello da Cultura Galega (in Galician). Biblioteca Virtual Galega (in Galician). Biblioteca Virtual Miguel de Cervantes (in Galician). Biblioteca Digital Hispánica Biblioteca Nacional de España (in Spanish). Translation from Galician to English of 11 poems by Rosalía de Castro (in English). This page was last edited on 9 April 2019, at 23:00 (UTC).